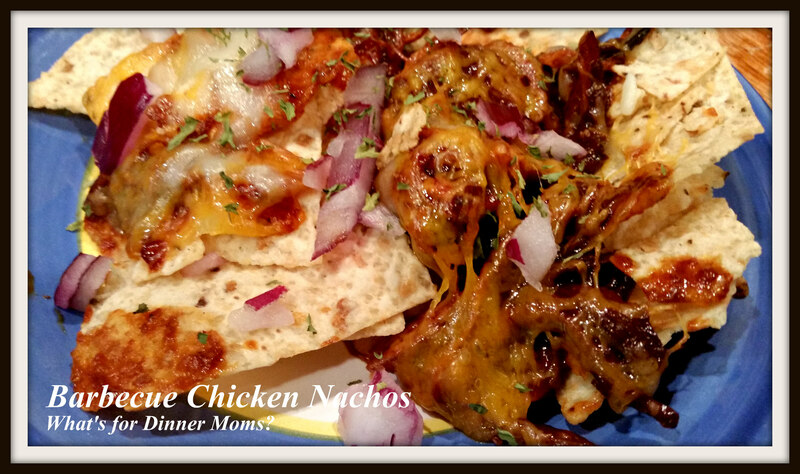 Easy Barbecue Chicken Nachos – What's for Dinner Moms? “Some days are like that, even in Australia,” is a sentence that is said around our house on bad days. It is from the book Alexander and the Terrible, Horrible, No Good, Very Bad Day by Judith Viorst. Everything goes wrong for Alexander all day long. Maybe things are better in Australia? At the very end he realizes that some days are just bad days, even in Australia. This dinner was a bit of an end to an Alexander kind of day. The chicken was slightly overcooked in the slow cooker, 9 hours will do that to it, and some other things we had been working on during the day seemed to take twice as long as needed. So, to salvage dinner we shredded the Barbecue Chicken in the Slow Cooker and added lots of cheese and onions to make nachos. This was better than I thought it would be. I think if you put enough onions and cheese on something it makes it all good. It was a quick dinner – from the slow cooker, to the oven, to the table in less than 15 minutes. Some days you need these meals. Give everyone a salad and it is a fun complete dinner. My kids thought it was great that they had nachos for dinner. A drizzle of ranch dressing over the top can add a bit flavor and make it look really good too. Place chicken in slow cooker with water. Cover and cook on low for 6-7 hours. One hour before you plan on eating remove the chicken from the slow cooker and remove most of the liquid from the bottom of the slow cooker. A little bit is okay but too much will water down your barbecue sauce. Shred the chicken and place it back in the slow cooker with the barbecue sauce. Stir to coat chicken. Cover and cook for 30 minutes to 1 hour. Fifteen minutes before dinner layer a rimmed backing sheet that has been covered with aluminum foil sprayed with non-stick spray and preheat oven to 350 degrees. Place the tortilla chips on the prepared tray. I like to add some of the cheese in the middle to spread the flavor throughout. Top with shredded chicken and the rest of the cheese. Bake the chips for 12-18 minutes until the cheese is well melted. Remove from oven and serve with a drizzle of ranch dressing, if desired. Thank you. I was just thinking about how awful it looked! Awesome that it’s a slow cooker recipe! And I agree – enough onions and cheese will make anything dee-lish-us! Love Nachos. Never had them with chicken on them. It was different for us too but they were very tasty. Overcooked chicken that fell apart just became Nachos. A happy accident! Sounds like my kind of meal. But every one got fed and enjoyed it. Exactly! Make the best out of what you have. Thank you. It was a happy accident. You did a SAVE! yahoo! Oh, wow! Those sound really good! I am so excited about this blog! I am going to be making food and sending you pictures of your recipes! Yay! Thank you! Also remember to make them your own! Taste and adjust spices to what your family likes. We love garlic so I tend to go heavy on the garlic and spices. Some like more sauce or less sauce in recipes so make it yours and share it with us what your family liked!